The first time I went to a lecture on supersymmetry the auditorium was so packed that many people could not get in. I was pleased I had anticipated the high demand and arrived very early. In his talk entitled “Is the End in Sight for Theoretical Physics?” The speaker explained to us that supersymmetry was the greatest hope for theoretical physics because it offered the possibility to unify the gauge theories of particle physics with a quantum theory of gravity in a way that might avoid the infinities of quantum field theory. The speaker was of course Stephen Hawking and the occasion was his inauguration as Lucasian Professor in Cambridge. The version of supersymmetry that had him so excited was N=8 Supergravity in 4 dimensions. Cautiously he predicted that a complete theory of particle physics could be worked out in 20 years time using this new superunified theory. 30 years have passed and we know that things did not work out quite as Hawking has hoped. He thought that N=8 supergravity might be a unique candidate for a fully unified theory of physics, although the particles we now know as fundamental would have to be composite. He did not consider higher dimensional theories because he thought that details such as the number of spacetime dimensions could be explained by anthropomorphic arguments. A few years later, supergravity was replaced by superstring theories and higher dimensions became mandatory. The underlying theory still possesses a similar uniqueness but now anthropomorphic arguments are needed to select the real world vacuum from a vast landscape of possibilities that superstring theory offers. Hawking has now retired as Lucasian professor to be replaced by one of superstrings’ pioneers, Michael Green. Supersymmetry and superstrings face a skeptical backlash from a large section of the younger generation who are disillusioned by its failure to provide clear predictions for particle physics or cosmology after so much time. Now the table may be turning full circle and this time support for supersymmetry comes not just from theory, but from experiment too. The version of supersymmetry that has come to the fore is the Minimal Supersymmetric Standard Model – an extension of the well established Standard Model of particle physics that includes an additional broken supersymmetry. This leads to one superpartner for every familiar particle that we know already, plus an alternative Higgs sector with fives Higgs particles, two of them charged. The MSSM first appeared just a year after Hawking’s lecture. Since its early days it has been understood that it improves the naturalness of low energy particle physics due to anomaly cancellations that help keep the Higgs sector light. With the addition of supersymmetry the three running coupling constants converge at one energy point, suggesting a dessert of new physics up to a more complete unification at the GUT scale. The model also provides a natural R-parity symmetry that would make its lightest particle stable. This offers a unique candidate for dark matter whose stability would otherwise be very hard to explain. For the last decade or perhaps more, theorists have been anticipating the imminent discovery of supersymmetry in the world’s highest energy particle accelerators. Fermilab was thought to have a chance of discovery with the Tevatron and there were even some false starts that faded away as the statistics grew. Now their hopes turn to the Large Hadron Collider but the Tevatron is not finished yet. In recent months we have seen some tantalising results reported by Fermilab that support the MSSM. Nothing is conclusive yet, but the combined evidence all seems to point in the right direction. For those of us who grow up with the idea that supersymmetry is the final move in a game of unification that leads inevitably to a complete theory, these reports are too hard to dismiss. After the ICHEP conference we drool over the results that should have been shown, but weren’t. Plots which show inconclusive signals of less than 3-sigmas statistical significance are quick and easy to approve for publication. They don’t lead to big headlines. Anything above three sigmas would count as an observation and that puts it in a different league of results. 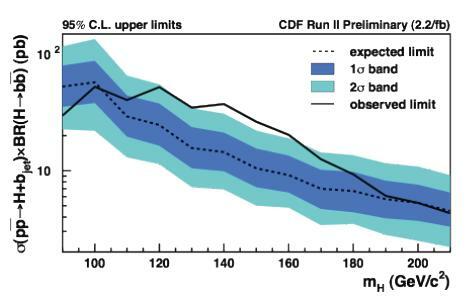 With some history of failed observations from the past, Fermilab are likely to put off publication until the next round of data is seen to add rather than subtract from the result. For us the outsiders, the mere absence of certain plots starts to look like a sign to get excited about. For the supersymmetry skeptics the conclusions to be drawn are different. Any signal below 3 sigma is to be dismissed as noise. They can even dismiss the exclusion of the Higgs mass range that now strongly supports a light Higgs sector as predicted by supersymmetry. It is indirect and still inconclusive. If supersymmetry is indeed just below the surface, what will happen next? 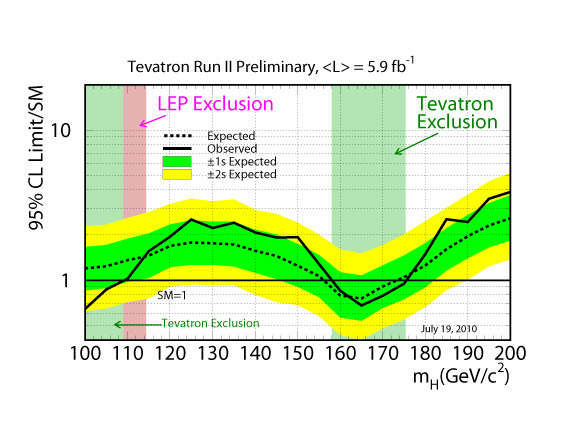 The Tevatron will continue to analyse the data they have while collecting some more until about 2013. The signal will grow until it is clear that something new has been seen. 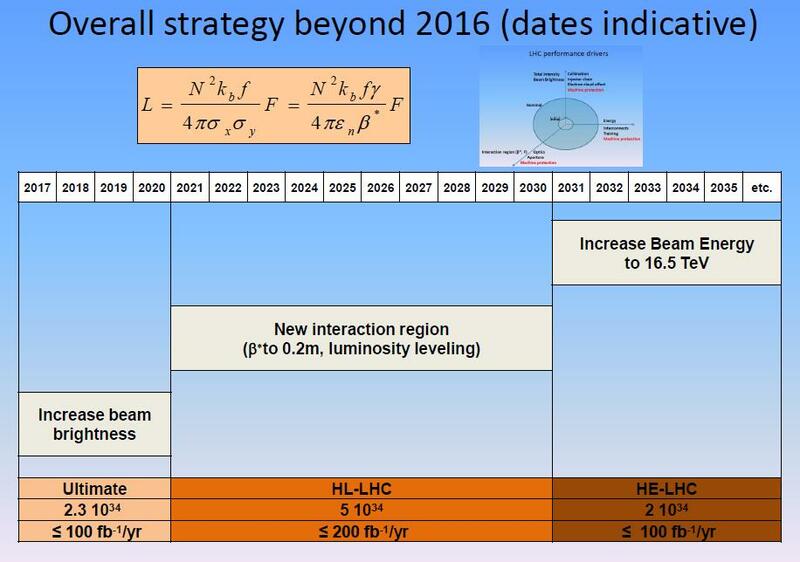 The LHC will not have the luminosity to see the low mass Higgs sector before the Tevatron, but supersymmetry will offer other new particles of higher mass. The LHC might pick out some of those very quickly and start to study their properties. Very soon the parameter space of supersymmetric models will be narrowed down. There will be a huge spurt of activity amongst theorists as they figure out how particle physics works at this scale. If there really is a desert of new physics beyond supersymmetry it may be possible to work out a convincing scenario for physics right up to the GUT scale. Possibly the next generation of accelerators will be needed to pin down most of the coupling constants. If they are clever enough, there may be enough information to figure out the mechanism for breaking supersymmetry at the GUT scale. That could reveal a perfectly supersymmetric world at higher energies with far fewer free parameters. It will not stop there. If supersymmetry is part of gauge field unfication then its unbroken gauge form will include supergravity. The experimenters will have had their day again as theory pushes into higher energies with renewed confidence. How far it will run is hard to say but the connection between supersymmetry and quantum gravity is hard to pull apart. Knowing the details of supersymmetry at the electroweak scale could be enough to lead us to the end of theoretical particle physics in the sense that Hawking predicted 30 years ago. Perhaps even superstrings will suddenly look right again. Until we have the next results from experiment we cannot be sure, but that is what makes the current situation so exciting. In just a few years – perhaps even just months – a renaissance of particle physics merging experiment and theory might be well underway. It might pan out in a less predictable way than I have suggested here, but it is sure to be revealing, if it happens at all. Update: see also the discussion on Lubos blog, and of course his many detailed pages extolling the virtues of supersymmetry. The Large Hadron Collider has today reached new record luminosities of about 2.8 Megahertz per barn using 25 bunches per beam. Each experiment now sees 16 collisions per turn which is twice the number in the previous scheme that used 13 bunches per beam. With some tuning slightly higher luminosities will be possible. The current plan confirmed by Steve Meyers at ICHEP is to run with this scheme constantly during August. This will give the collider control teams the opportunity to perfect their operations and improve stability so that they can get the maximum amount of stable beam time. It should now be possible to sustain average luminosities of about 2 MegaHertz per barn with this scheme. If they can produce enough hours of stable beam per day during August the experiments could collect about ten times the integrated luminosity seen so far. From results presented at ICHEP – especially the dijet and dimuon observations – there is some hope that new physics at above 1 TeV could already become evident with such a data sample. After August they will once again start to step up the number of bunches ready to collect the much higher target of 1 inverse femtobarns by the end of 2011. The Large Hadron Collider has demonstrated multi-bunch injection for the first time by injecting 24 bunches, arriving in batches of 4 at a time from the SPS. In the previous runs up to 13 bunches were used in each beam, but they need to inject more bunches to reach higher intensities. They have a target to collide 24 bunches throughout the month of August. After a technical stop last week the LHC had been slow to get restarted properly but this latest test puts them back on track. Now they have to repeat the injection for both beams at the same time and ramp them to high energies for collisions. They will be hoping to do that in the next few days ready for August. Eventually the LHC will circulate 2808 bunches in each beam and to do that they will have to be able to inject 72 bunches at a time from the SPS. There has been a lot said about accelerator experiments and about neutrino beam experiments but now I want to put in a word for another important particle experiment. 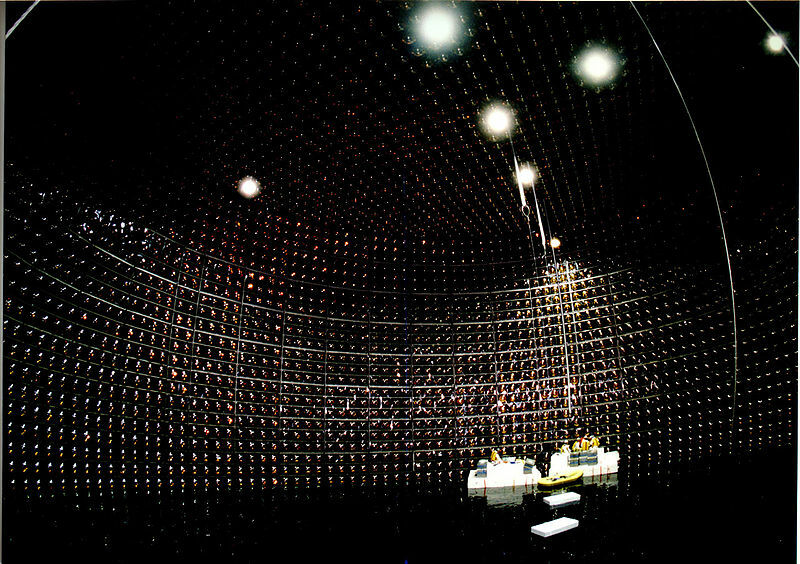 Super-Kamiokande started in 1996 and was an upgraded version of the original Kamiokande experiment started in 1985. It consists of a large tank of very pure water surrounded by a large number of photomultipliers to detect Cherenkov radiation from any interactions or decays in the tank. Super-Kamiokande has had some spectacular success in detecting solar neutrinos and demonstrating neutrino oscillations, but its original purpose was to observe nucleon decays which are predicted by most grand unified theories. This type of experiment is unique in that it has a possibility to observe effects at the grand unified scale in non-cosmological context. Accelerators can not get anywhere near the energies required to probe this scale. It is well-known that Super-K has had negative results so far in its search for nucleon decay. This does not sound good but in fact this has been one of the most powerful results for theorists looking at particle models beyond the standard model. If ever a Nobel Prize was deserved for a negative result this would be it. Super-K looks for two main decay channels for protons. The first is decay to electron plus pion, The second is to a Kaon and an anti-neutrino. Conventional GUT theories predict mostly the first mode, but supersymmetric models favour the second. The first GUT theories used an SU(5) gauge group to unify the electroweak gauge theory with QCD. This predicted proton decay with a lifetime of between 3 x 1028 and 3 x 1031 years in the first mode. Super-K has set a lower bound of 7 x 1033 years, so this theory is long since dead. SO(10) GUT can accommodate 1030 to 1040 seconds so its parameter space is much reduced but it still lives. SUSY versions of SU(5) are also ruled out by a 3 x 1033 limit on the second channel, while SUGRA SU(5) and SUSY SO(10) still cling to life. In 2001 Super-K suffered a spectacular accident when a photomultipier tube imploded and stated a chain reaction of implosions spread by shock waves through the tank. Many expensive tubes were lost. initially the remaining tubes were redistributed and the experiment limped on as Super-K2. In 2006 it was fully restored and now it continues at full strength as Super-K3. The real hope is that Super-K will see some positive results for nucleon decay. The parameters of the decays could then be studied in more detail to understand the GUT scale. Even if this does not transpire the possibility of ruling out more models makes Super-K a very worthwhile experiment. The combination of the CDF and DZero results previously described individually are now available. The main result is that there is an exclusion from 158 GeV to 175 GeV. This means that the ranges left for a Higgs are from 114 GeV to 158 GeV or from 175 GeV to 185 GeV. This will be described at ICHEP this afternoon by Ben Kilminster. As for the Higgs-plus-bottom channel, it shows an excess of just over 2 sigma in the range 130 GeV to 160 GeV. Very tantalising but also very inconclusive. A 2-sigma effect is normally regarded as no more than noise in the experimental physics community. They need 3-sigma to call it an “observation”, and 5-sigma to call it a “discovery”. This result is based on only 2 inverse femtobarns of data at one of the experiments. Why did they not show a combined result as they didi for the Higgs searches? 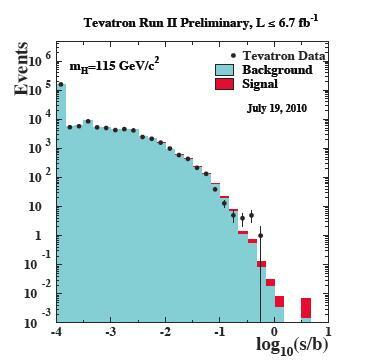 There is one last plot of interest that shows binned signals on a hypothesis of a Higgs at 115 GeV. This has a clear anomaly over two or three bins. Be wary to draw too many conclusions. Nicolas Sarkozy has delivered a rousing speech to particle physicists at the ICHEP conference in physics. He talked of the need to ask fundamental questions in science and to continue focusing on long-term projects without letting any short-term crisis get in the way. While other countries have been tempted to reduce spending on science because of economic concerns he said that France has increased funding because they believe that science and technology is the solution to exit the credit crunch. Sarkozy spoke of science in France with particular emphasis on Saclay who will benefit from a billion Euro investment. Then he turned to the international collaborations such as CERN saying that these were the future direction for physics. He ended his address by saying that some people wondered why he would appear at a physics conference when there are so many political issues to concern him, but he says that nothing could be more important than international science and he need make no apologies for being there. Of course there is a big practical reason why he wanted to talk to the physicists. The next collider project – the International Linear Collider – is now at a critical stage of planning. The big question for the politicians is where will it be located? CERN is an obvious candidate but it could just as easily be built in the US or Japan. The Large Hadron Collider could run for several decades and will keep the CERN site busy. The ITER international fusion project is already under construction in France. The politicians from the US and Japan will therefore argue that the ILC should go elsewhere. 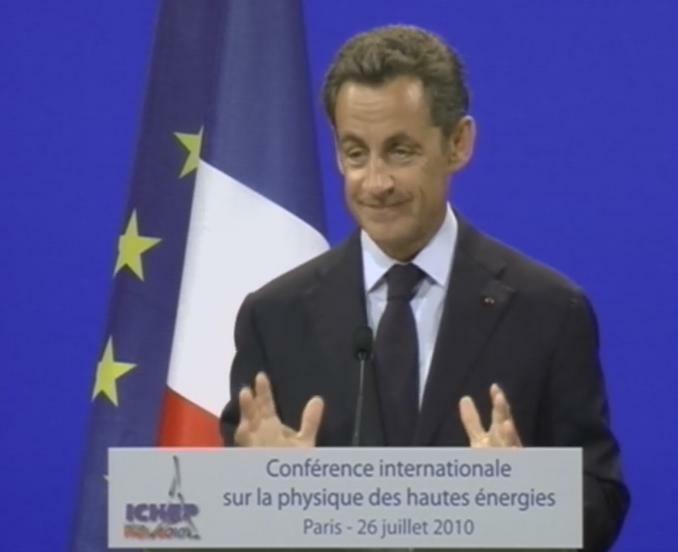 By addressing ICHEP, Sarkozy is showing the physicists that the government of France understands their goals and needs and is investing in science while other governments cut back. He knows that many physicists at the conference will be key in arguing the scientific case for where the ILC will be situated. His speech was designed to win their hearts and minds to clinch the case for building the ILC at CERN. His 40 minute speech was greeted with a standing ovation from the 1000 physicists who packed the Palais of Congress to hear him talk in between reports on progress in particle physics around the world. Update: It’s interesting to see the press reaction to Sarkozy’s address, or rather the lack of it. There have been very few reports, especially outside France. The Gardian blog has a report by Jon Butterworth describing the speech as enlightening. “I wish we heard more of that in the UK” he says. As a UK resident I share the sentiment. During the recent general election I spoke to our local conservative MP who canvassed at my door. “Why are there so many cutbacks in science?” I asked. I was hoping he would criticise the labour government who were making the cuts. “We need the cuts because there is a credit crunch” he said. But you cant just stop and start science, it is a long term enterprise, and furthermore science and technology is the bext hope for getting out of the crisis, especially in the UK where we have very little heavy industry, agriculture or natural resources to export. Should we just rely on the banking sector to recover and pull use out of the crunch, or should be build up our technological exports? The logic was lost on my conservative MP who was duly elected into office despite my vote. Yesterday Sarkozy seemed to understand better, but what do the French think? Le Monde reports it without much comment, but at least one French science blog has a different perspective pointing to cuts at the CNRS and describing the speech as propaganda. I guess the address was not directed at them. You are currently browsing the viXra log blog archives for July, 2010.